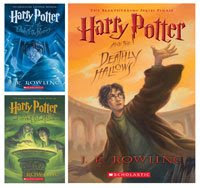 Book #7 Paperback Release: Harry Potter and the Deathly Hallows is a breathtaking finish to a remarkable series. The final chapter to Harry Potter’s adventures will be released in paperback July 7th, 2009! It all comes down to this - a final face off between good and evil. You plan to pull out all the stops, but every time you solve one mystery, three more evolve. I've heard that many kids plan to re-read the whole Harry Potter series this summer. Movie Release: The Warner Brothers Pictures movie Harry Potter and the Half-Blood Prince arrives in theaters July 15th. Museum Exhibit: Visiting Chicago this summer? Don't miss the world premiere of Harry Potter: The Exhibition at the Museum of Science and Industry in Chicago. According to the press release you can view key movie artifacts like Professor Snape’s™ original costume; Sybill Trelawney’s crystal ball; artifacts from the Yule Ball, including costumes from notable characters such as Harry, Ron, Hermione and Professor Dumbledore™; and life-size centaurs, a caged dragon, Buckbeak and giant Acromantula. In addition, guests will have the opportunity to pull a Mandrake from its pot in the Herbology vignette, toss a Quaffle in the Quidditch area, and tour Hagrid’s hut. The exhibit is at the Museum of Science and Industry from April 30, 2009 to September 27, 2009. Theme Park: In 2010, "The Wizarding World of Harry Potter" theme park will open at Universal Orlando Resort. • Contest ends on Monday, July 13th, 2009 at 11:59 PM CST. Oh my daughter would be super thrilled to received these as she has had to borrow her big brother's editions and be sooo careful with them! She would love her own copies!! I just twittered about this contest! Plus I follow you on Twitter! Me and my Daughter are both fans! We would love to read together the final books..Thank you for the information about the Chicago Museum. This would be an amazing contest to win. I'm a huge HP fan. I wish I was going to be in chicago, I would love to see the exhibit. I'm already a follower for your blog. I would love to win this for my daughter since she has recently started to read the series. My daughter talked me into reading the first three books and they were great. This would be a great giveaway to win for the both of us. I love the Harry Potter series. I have watched all the movies, but now need to read the books. My grandson is really into Harry Potter and he would love this! Thank you so much! So far I have read up to book 5. I guess I better get busy reading so I can get caught up. Would love to add these to my collection. I just found your blog and I'm so glad I did because it's awesome! I don't know how I didn't get here before this. This is such a great contest, please include me too! I love reading about Harry. I'd love to win! I know I'm way behind the curve, but I'm still working my way through the series, so I'd love to get these books. Thanks for the great giveaway! I bought the first 6 in hardcover and still haven't read the 7th, so I'd love to win a copy! What a great giveaway! I received all the books up to number 4 as gifts, then people stopped giving them to me. So books 5,6, and 7 are the ones I still need! I'm just now really getting into reading the books. I'm excited about the newest release! Ah I really want this so I could complete my collection! I love Harry Potter!! This would be a fabulous addition to my collection. Once the park is open in Orlando, I hope to get there one day. Thanks for the great opportunity. I love the Harry Potter series and so does my husband. The "life story" of the author is fascinating. This would be a cool giveaway to enter - I am hoping to make it to the Chicago exhibit this summer with my daughters! Gosh I wish I lived near Chicago. I have family there but I wouldn't ever be able to go. :( I'd die if I got the chance to see the HP exhibit. Okay I wouldn't die but I'd be sooo happy!!! :D I just love HP so dang much. Thanks for this Harry Potter giveaway - I'm anxiously awaiting the next movie coming out in July. My son is just about ready to start reading the first book, so I'd love to have these waiting for him! I'm a huge Harry Potter fan and I'm a subscriber of your blog. I'm blogging about the contest (I'm doing the giveaway too). My family loves Harry Potter! My daughter and I both would read these books. Can't wait for the new movie to come out in July! I can't wait for the new Harry Potter movie! This contest = awesome. I'm so excited about the new Harry Potter movie. The previews look awesome. What a great package! I am interested and thanks for the info on the exhibit as well as the theme park. I never thought the books would be better then then the movies but of course i was wrong. I've read the whole series, but would love to send these to my son. He's hasn't read these last three. I'm getting close to starting the series with my son. Can't wait! Please enter me. I love HP! Thank you so much for this contest! Please enter me. I'm following you on Twitter and just tweeted about this giveaway. I'm also subscribed to this blog. Very professional blog, I must say! Email is skirkland@triad.rr.com. Thanks! Please enter me.. I would love to read these.. I would love to win these for my son! Please enter me. I would really love to win this gift pack. I would love to win this! I have read the series once, but borrowed all of the books... I would love to read them again! Just like a reader before me stated, I borrowed most of the books instead of buying them and it would be nice to read one of them again! I added you to my google reader, so I will see your updates! My husband would love this prize pack! What a great giveaway. Super excited about the new movie coming out soon! cannot wait. Thinking about re-reading the books for a refresh! I would love to win this book--thanks! I already follow you via Blogger--thanks! I really should re-read these books again. I loved them when I read them in hardback, but it's been a while. Wow, please enter me! I always feel like I'm one of the few people in the world who don't own all these books lol. I'm a new follower, and I'm following you on twitter! I want to win this, thanks! I intrduced my child to Harry Potter! I own the first four books. Somehow they got misplaced when we moved on three occasions. I've been asking my mom about them for weeks. It will be nice to get these three to finish off my Harry Potter collection. The whole family read a lot and Harry Potter is one of our most favorites! I would love this for the family. How sad am I: I haven't read any of the HP books! I know, I know, I'm just busy with the big pile of "to be read" books already by the bed. But I promise they're on my list! Winning this prize pack would encourage me to start at the beginning! I have read all the books but would love to actually own them so I can reread them all. I started reading the HP books but still have to read books 5 - 7!!!! Like the previous commenter, I haven't read any Harry Potter books. Give me a reason to start! What a great giveaway ~ now you can take a paperback with you and not have to worry about the hardcovers getting lost or dirty. Oooah, this is awesome! I knew about the Chicago museum exhibit, it would be fun to stop down to with my niece and nephews. You go girl keep up the good job!!! I love the Harry Potter series and am looking forward to the newest movie coming out. I would love to win the lst several books as I would like to re-read them again! Commented the other day. Guess it didn't go through. I have been a Harry Potter fan since the fifth grade. Unfortunately. I walked away after the Goblet of Fire. All of my books have been misplaced or sold, because we moved several times. Now, I've made it my goal to catch up. Winning this would...wait this isn't an essay competition. I'd love to have more Harry. Posted this book giveaway on my blog. Can't wait for the next movie. I'm slowly collecting all the books (can't afford to buy all at once!) and winning a set of three would be amazing! Thanks for Chicago Museum info. Take y girls to Chi-town for American Girl Store...now I can add Harry Potter on, too! Sounds like a great opportunity. My little ones will be so happy if I win. Thanks for the opportunity. Heard about you through tor.com and I'm really liking this site. Believe it or not, I am probably the last person in America to be reading the Harry Potter books! My husband has always read & loved them...and now even my daughter. So I figured it was my turn. It would be wonderful to have these for mine instead of constantly getting them from the library! I have loved my harry potter books so much they're stained from bath water and wrinkled from me sleeping with under my pillow. Every store I go too Harry is either too expensive or sold out. I would really love to get the rest of the books that I don't have(5and 6). Please consider me for the prize. I would love to win these for my son who really is beginning to love to read! Thanks for the links to the Harry Potter sites! Thank you for the contest! I subscribe to google reader, too. Harry Potter fan! I want to win this! My son loves Harry Potter books and movies! Great package! Love to get this for my nephew, who's working his way through the series now that he's at this reading level. Great prize. I haven't read Harry Potter books, but would like to start.